Humans are always trying to be healthy. When they are sick, they will seek and find medication and methods that are suitable for their physiological and psychological conditions. One of the unique medication and methods in the treatment process is to use music to intervene such psychophysiological conditions. Some studies used modulated high frequency (HFCs) in inducing participants (respondents)’ condition, and in fact obtaining good results. But the use of these objects in the previous studies is still a single sound chosen from the width of the music frequency range, not yet directed towards music. One type of music that is quite interesting is MIDI as the music is derived from sampling sound composition which turns out to have a fairly wide frequency region, one of which is the ultrasonic region as found in my musical project “Yogyakarta Nyaman”. Physically, in the medical world, ultrasonic sound frequencies are used in intervening physiological conditions. Based on the description above, the focus of this study is to use “Yogyakarta Nyaman” in the psychophysiological responses of the respondents. The method used is quantitative with 18 respondents divided into nine men and nine women. Data are collected from structured interviews where the results are converted into numbers to give a numerical description. The results of the study showed that “Yogyakarta Nyaman” was able to intervene in the physiological and psychological conditions of the respondents with fcount > ftable. The fcount value is 5.179 greater than ftable around 3.86. Manusia selalu berusaha sehat. Ketika sakit, mereka akan mencari serta menemukan pengobatan dan metode yang sesuai untuk kondisi fisiologis dan psikologis. Salah satu pengobatan dan metode yang unik dalam proses pengobatan adalah menggunakan musik untuk memberikan campur tangan terhadap kondisi psychophysiologicalnya. Beberapa studi lain menggunakan frekuensi tinggi modulasi (HFC) dalam merangsang kondisi peserta dan telah mendapatkan hasil yang baik. Tetapi penggunaan benda-benda ini hanya berupa satu suara yang dipilih dari lebar kisaran frekuensi musik dan bahkan tidak diarahkan ke musik. 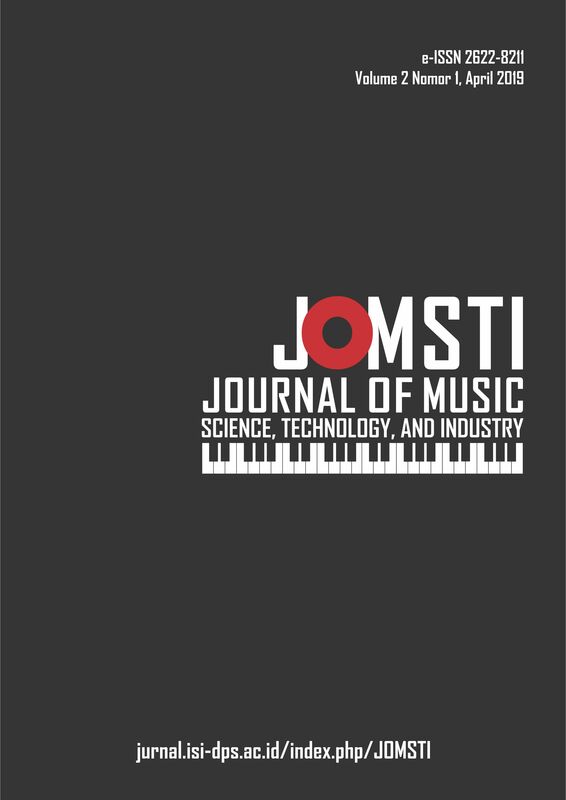 Salah satu jenis musik yang begitu menarik adalah MIDI sebagai musik yang berasal dari sampel suara komposisi yang ternyata memiliki wilayah frekuensi cukup lebar, salah satunya adalah wilayah ultrasonik dalam proyek musikal penulis yang berjudul “Yogyakarta Nyaman”. Secara fisik, dalam dunia medis, frekuensi suara ultrasonik digunakan dalam intervensi kondisi fisiologis. Berdasarkan uraian di atas, fokus dari studi ini adalah untuk menggunakan “Yogyakarta Nyaman” untuk mendapatkan tanggapan psikofisiologis para peserta. Metode yang digunakan adalah kuantitatif dengan responden 18 yang dibagi menjadi sembilan laki dan sembilan perempuan. Pengumpulan data yang digunakan adalah wawancara di mana hasilnya dikonversi ke dalam angka untuk memberikan gambaran numerikal. Hasil penelitian menunjukkan bahwa “Yogyakarta Nyaman” mampu memberikan campur tangan bagi kondisi fisiologis dan psikologis responden dengan fhitung > ftabel. Nilai fhitung adalah 5.179 lebih besar dari ftabel sekitar 3.86. Creswell, John. 2012. Research Design, Pendekatan Kualitatif, Kuantitatif dan Mixed. Pustaka Pelajar: Yogyakarta. Gabriel, J.F. 1996. Fisika Kedokteran. Departemen Fisika UNUD, Penerbit Buku Kedokteran Bali. McFarlone, Thomas. 2000. Quantum Physics, Depth Psychology and Beyond. Standford Org. Oohashi, Tsutomu, et al. 1993. “On Mechanism of Hypersonic Effect”. ICMC Proceeding, p. 432-434. Oohashi, Tsutomu, et al. 2000. “Audible High-Frequency Sound Affect Brain Activity: Hypersonic Effect”, Journal of Neurophysiology, 83: 3548-3558. American Psychological Society. Oohashi, Tsutomu, et al. 2002. “Multidisiplinary Study on the Hypersonic Effect”, International Congress Series, Volume 1226, Januari, p. 27-42. Oohashi, Tsutomu, et al. 2006. “The Role of Biological System other than Auditory Air Conduction the Emergence of Hypersonic Effect”, Brain Research, Volume 1073-1074,16 February 2006. p. 339-2-347. Schahter, S; Singer, J.E. 1962. “Cognitive, Social and Physiological Determinants of Emotion State”, Psychological Review, 69. p. 379-399.